Witch hazels and snow drops are considered by many to be the superstars of the late winter garden. While rightfully so, it shouldn’t be at the expense of other noteworthy plants. Chimonanthus, or fragrant wintersweet, offers both flower and fragrance to the winter garden. A member of the Calycanthaceae family, Chimonanthus praecox was introduced from the far east in 1766. The shrub can reach 10 – 15’ high and 8 – 12’ wide in southern climates. 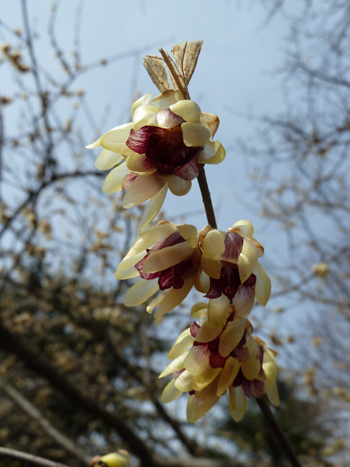 Michael Dirr’s observations find Chimonanthus attaining smaller proportions in northern zones. Dirr theorizes that colder temperatures may regulate size and growth. Hardy from zones 6 to 9, wintersweet prefers full to partially shaded exposures with good drainage. The multi-stemmed shrub bears simple, elliptic-ovate leaves that are rough to the touch. The dark green leaves change to muted shades of yellow in the fall. While subtle in effect, the color adds another facet to the shrub’s appeal. The true selling point of Chimonanthus is the fragrant, cupped flowers appearing in late winter. Each flower is borne single on the previous year’s wood. Depending on species, flowers are varying shades of near transparent yellow. Flowering is spread across several weeks with new buds opening depending on temperatures. 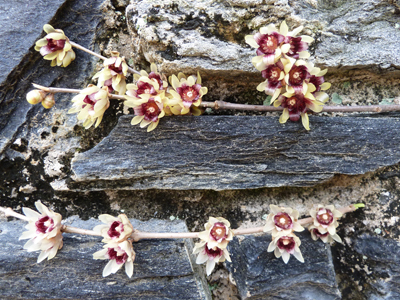 Consider setting Chimonanthus near a door or path where the fragrance can be appreciated. Planting within a courtyard or near a wall can provide protection from frost that can damage open flowers. One wholesaler suggested allowing clematis to scramble up the trunk and branches. The vine will benefit from the support and provide another layer of interest during the growing season. Prune older branches to maintain vigor and shape. Pruning should be done after flowering. 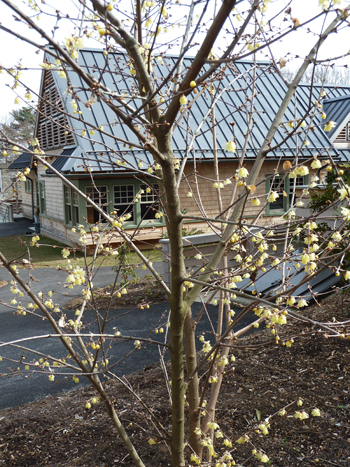 Growing near the entrance to the Cunningham House is Chimonanthus praecox ‘Luteus’. As the cultivar name implies, golden yellow flowers distinguish this wintersweet from the straight species and the cultivar ‘Grandiflorus’. C. praecox ‘Grandiflorus’ bears slightly larger flowers with an overall larger habit compared to the species. Research suggests that C. praecox produces greater fragrance. All three can be seen at the Scott Arboretum. C. praecox ‘Luteus’ will be available for purchase that the 2011 Scott Associates Plant Sale. This is one of my very favorite shrubs. I’m in central MD (z7) and it blooms all through January and February. It’s not necessary to plant it next to a path to appreciate the fragrance. I discovered this plant by following my nose on a winter day in a public garden about 20 years ago. Mine is about 10 ft. tall now and I can smell it across the yard on sunny days. This is really lovely in winter; the photo doesn’t do it justice. It’s not a “hey, look at me” bloomer like an azalea; it’s rather restrained and sort of Asian-looking. The straight species is understated, but the cultivar ‘Luteus’ is stunning. The first time I visited the Scott Arboretum I was introduced to this wonderful shrub. I entered the building and caught a whiff of the most delightful fragrance. Andrew Bunting, who was to lead our tour, heard me ask, what it was, and was kind enough to enlighten me. I made a mental note to search it out. Imagine my delight when after becoming a member, I found Chimonanthus praecox ‘Luteus’ at the biennial plant sale. Mine is approx. 6 ft. tall now, and I planted it in my front garden beds near the walkway. I live in town, with quite a bit of foot traffic passing by my gardens. Many times, I have seen folks stop in their tracks, when they pick up the scent. At a post-MANTS party yesterday we had three different variations on this shrub: the straight species, with pale cream petals that don’t spread much and have a dark red stain; a cv with flowers much the same as the straight species, but with saturated bright yellow outer petals; and one with a larger-flowered, medium yellow flower that spreads open and has no red eye – it looks almost double compared with the others. Both the 2nd and 3rd were bought as C. praecox ‘Luteus’. I think the last one is true Luteus and that the 2nd one may be var. grandiflorus. Comments, Andrew? I would say the one with saturated yellow flowers is ‘Luteus’ and the one with larger flowers is ‘Grandiflorus’.